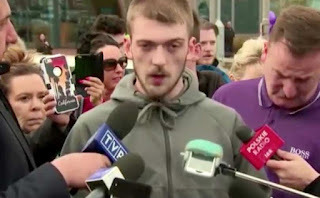 One of the most haunting sights I've seen in a long time was Tom Evans, the father of Alfie Evans, coming out to the street in front of Alder hey hospital and robotically reading words on a page asking those who support his efforts to save his son, to stop, go home and live their lives. What sticks with me are his hollowed eyes. The way he simply read the words and failed to make eye contact with all around him. It sounded like a letter read by a hostage. This, coming from a man who has inspired thousands in the way he has defended his son's life. But this is what he felt he must do to give his son a chance. I understand. My heart broke for him. This is the plight of the modern man facing the secular state behemoth. It was a desperate and beautiful act of love in the hopes that the oppressive heel of the state would ease slightly off his child's throat. A young boy was imprisoned, yes imprisoned, and the judge in the case could only think to scold the father to check his tone and speak only in subservient tones. What I heard was the judge saying that your son is going to die in our hospital and you will thank us for the deathbed we provide. Or your son will die alone. A doctor treating Alfie reportedly said that for Alfie to be allowed home would require a “sea change” in attitude from the Evans', and they feared that in the “worst case” they would try to take the boy to Italy for treatment. That was the "worst case?" So why was Alfie Evans kept in that hospital to die? That’s the question at the heart of this. What was more important than giving this child a chance to live? I fear that it is the healthcare system itself that is of paramount importance and must be preserved above all other priorities. They fear that people would lose faith in the healthcare system if they saw Alfie leave the country and perhaps even prosper. Yes, think about it, what was the "worst case" for Alder Hey and the NHS? It’s that the child would have gone to Italy and lived. Or worse yet, thrived. That was the outcome to be avoided. So she was willing to expose people to the risk of pregnancy or venereal disease by distributing condoms she knew to be faulty because it served “the greater good” of young people having misplaced faith in condoms. And there it is. The greater good. Greater than what? Greater than whom? To this way of thinking, individual lives are unimportant when compared with the comfort of the masses. That’s where things get dicey. That’s how you end up with body counts. That’s how you get Alfie Evans. Some years ago I watched a documentary on the design and building of the Berlin Wall between East Germany and West Germany. It included extremely rare clips of interviews with the architects (I was shocked to learn there was actually a deliberate design to that monstrosity). In one clip, an aging (former) East German Wall architect spoke briskly about the strategy of his designs. Although the interview was conducted during what must have been the last years of his life, he still seemed deeply resentful that he was being asked to defend the wall’s erection even after the fall of the Eastern Bloc. This is the same thinking that imprisoned Alfie Evans. Because Alfie Evans didn't matter to them — not in the big scheme of things. Alfie Evans’ recovery in Italy had to be avoided lest people lose faith in socialized medicine. And sadly, when you weigh the life of a baby with little chance of recovery against a country losing faith in its institutions, it’s an easy choice, right? It's not odd that a culture that has loosed itself from Christianity is abandoning the very idea of individual rights. And that’s what it’s about. Ironically it’s about preventing the loss of faith in the institutions of a country that largely abandoned its faith in God. So now you have the state playing God. And it seems to me that those who play God often do the devil's work. I can't help but wonder why every student in Catholic school wasn't told about Alfie Evans. My own children in Catholic school were unaware of this unfolding horror. So many times I've heard that making the faith relevant to young people is difficult. Well here it is. A drama ripped from the headlines that perfectly contrasts the beauty of Catholic teaching about the sacredness of life vs. the prevailing ethics of utilitarianism. The contrasting worldviews are laid bare. But we still have our voices. Speak to all who will listen. Remind them. Pray incessantly. A child, who was imprisoned, died. An individual child. And unless something is done, I believe Western civilization will share his fate.